You know you need a Flying Spaghetti Monster ornament to put on top of your Christmas tree, and this one by Etsy user Jordana was a big hit among this site’s readers last year. 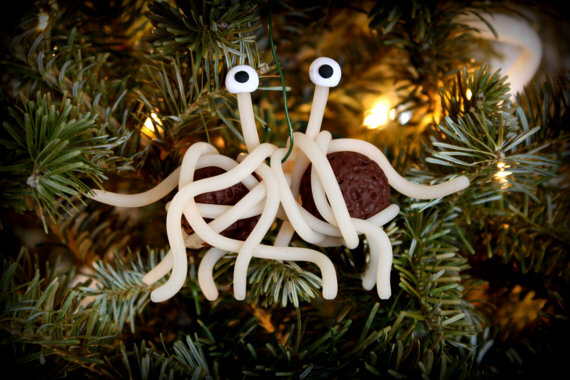 Adorn your Noodletide tree with this adorable Flying Spaghetti Monster ornament! Handcrafted to order, each polymer clay ornament is one-of-a-kind and measures about 4″x4″. Because they are made to order and high volume during the holiday season, expect your ornament to take about 3-4 weeks to ship. A wonderful gift for the Pastafarian in your life! Your relatives will love it. Or they’ll be very confused. But even that reaction is worth the price.